While de-cluttering my bedroom recently, I found an old magazine that reprinted my first published article in 1993. First posted in Alaska Women Speak, later in The Radical, I wrote it about the epidemic of domestic violence. How novel it seemed at the time to be writing about what was then considered to be a deeply personal matter. Pre-O.J.Simpson trial. Pre United States Surgeon stating that domestic violence was (then) a leading cause of injury to women in certain age brackets. It was truly wonderful to be a part of making a positive difference. Along with the other domestic violence advocates, I got to give a series of presentations and trainings. Trainings for judges, police officers, and employers. Presentations for clergy and public assistance workers, concerned citizens, and eventually for doctors, once it was confirmed how many victims presented with mental and physical injuries that needed attention. No matter who our audience was, we encouraged people to get a little nosy. “Ask when you see injuries if you have a private moment with the possible victim. Address concerns in a non-judgmental way.” Easier said than done. Below is from the Maine Coalition to End Domestic Violence. Just Listen: Listening can be one of the best ways to help. Don’t imagine you will be the one person to “save” you friend. Instead, recognize that it takes a lot of strength and courage to live with an abusive partner, and understand your role as a support person. Keep it Confidential: Don’t tell other people that they may not want or be ready to tell. If there is a direct threat of violence, tell them that you both need to tell someone right away. Provide Information, Not Advice: Give them the phone number to the helpline (1.866.834.HELP) or to their local domestic violence resource center. Be careful about giving advice. They know best how to judge the risks they face. Be There and Be Patient: Coping with abuse takes time. Your friend may not do what you expect them to do when you expect them to do it. If you think it is your responsibility to fix the problems, you may end up feeling frustrated. Instead, focus on building trust, and be patient. 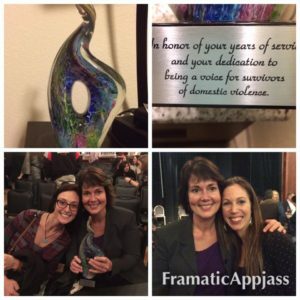 This past year, I’ve had the chance to join domestic violence advocates in a number of community presentations since publishing my memoir. 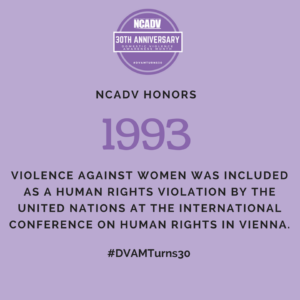 Abuse in relationships is still far too common, and well over 1,000 women every year die because of it in the United States alone. Millions of kids are still being raised in homes witnessing domestic violence. It’s natural to wonder Are we making a difference? Then I had coffee with my friend Ruth. She used to manage the Abused Women’s Aid in Crisis (AWAIC) shelter I worked at 20 years ago and we left our jobs around the same time. 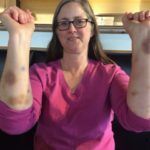 Now on blood thinners, Ruth bruises like a banana. 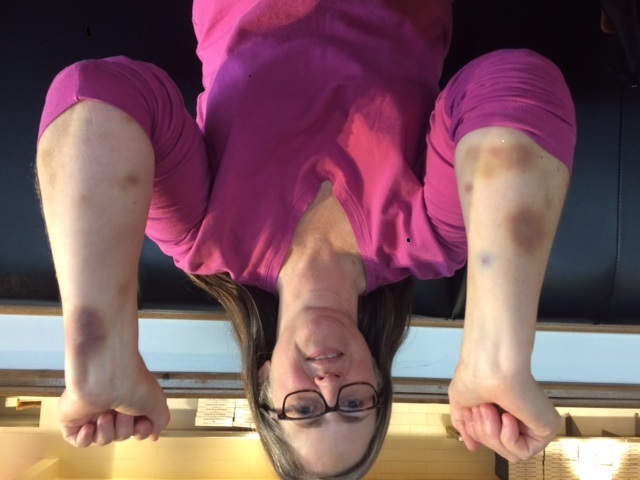 “Does anyone ask you about the bruising?” I asked. 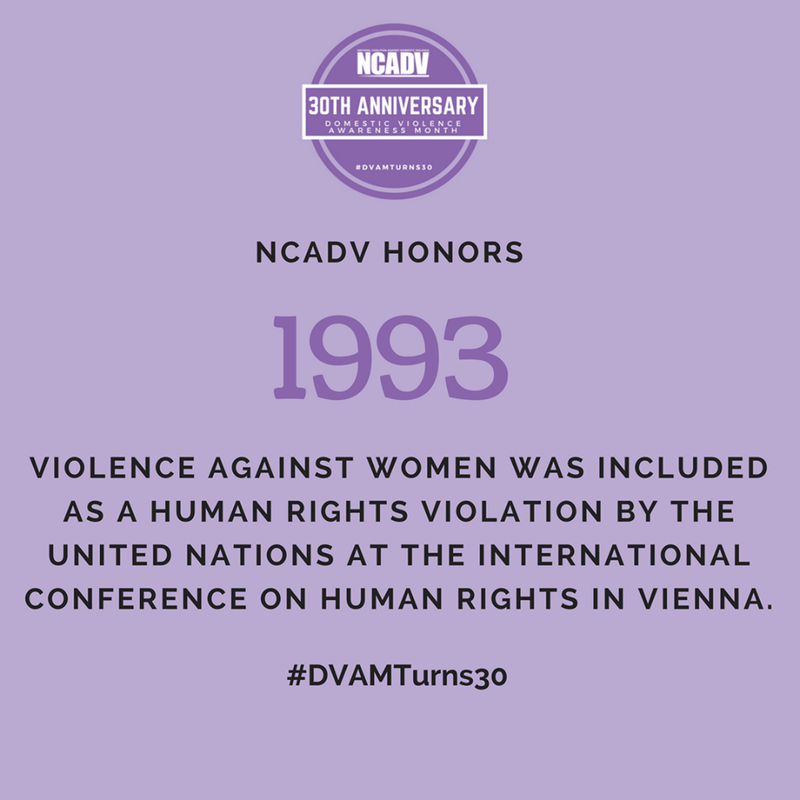 So Happy 30th Birthday to Domestic Violence Awareness Month, and to all who’ve stuck their neck out to ensure we’re making progress. I encourage you all to become a part of the conversation and part of the solution when opportunities arise. Or donate to or volunteer at your local shelter. As a side, I’m grateful to my friends at AWAIC for honoring me for sharing my story. Without them, there would be no story.